iTerm2 has a feature called "Captured Output" which helps you find and track important lines of output from logs, build processes, and such. Captured Output is a tool that may be added to iTerm2's toolbelt (a view on the right side of terminal windows). It works in conjunction with user-defined Triggers. A Trigger whose action is Capture Output looks for lines of output that match its regular expression. When one is found, the entire line is added to the Captured Output tool. When the user clicks on a line in the Captured Output tool, iTerm2 scrolls to reveal that line. Double-clicking on a line in the Captured Output tools run a user-defined Coprocess. Shell Integration must be installed because Captured Output ties in to command history. There are two capture groups defined. We'll come back to those later. Open the Toolbelt by selecting the menu item Toolbelt > Show Toolbelt. Enable the Toolbelt > Captured Output menu item to ensure it is visible. Kick off the build by running make. It spits out thousands of lines of output. 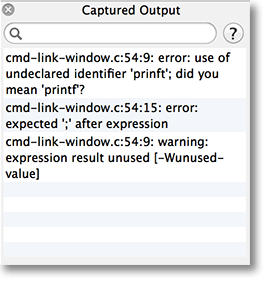 Any errors or warnings that appear in the compiler output will appear in the Captured Output tool. Select an entry in the tool. iTerm2 scrolls to display the line and briefly highlights it in blue. Type "vim filename.c", followed by enter, as though you were typing it at the keyboard. You can right-click on an entry in Captured Output to open a menu, which contains a single item: "Toggle Checkmark". This helps you remember which entries have been dealt with as you go through errors and warnings in your compiler output. Captured Output is linked to the Command History tool. If no command is selected in the Command History tool, then the most recent captured output is displayed. Otherwise, the captured output from the selected command is displayed. You can remove a selection from the Command History tool by cmd-clicking on it.